As if to remind everyone that corruption existed before 2013 as well, Ivan Camilleri reported on Times of Malta about the former Mayor of Rabat who, according to recordings held by the police, took kickbacks for a cleaning contract and cancelled the contract when he tried and failed to extort a raise. This happened, allegedly, in 2006. The Mayor of Rabat at the time was Frank Fabri, then the darling of the Labour Party who however chose in 2007 to quit politics and rise in the civil service. He was made Director in 2007, a position incompatible with elected office, and has since been rapidly promoted and is now the civil service supremo of the education department. In 2010 the police charged the person who allegedly paid bribes to Frank Fabri and accused him of corrupting a public officer. He was acquitted because the court deemed that since no one could testify whose voices were on the recordings played in court it could not convict the cleaning contractor. The funny thing is the Mayor was never charged for receiving the bribes. That’s in spite of the fact that when called to testify in the case of the man who allegedly bribed him he refused to answer questions to avoid incriminating himself. And it’s also in spite of the fact that the Council’s secretary confirmed he cancelled the cleaning contract on the Mayor’s instructions. So many implications of this it’s hard to think where to begin. Here’s another institution of this democracy — the civil service — that is now well and truly in the midst of a confidence crisis. Yesterday the Director General of Fisheries was suspended — on full pay jekk jogħġbok — after the Spanish newspapers carried transcripts of her soliciting bribes from a tuna laundering kingpin. Frank Fabri’s case is considerably less lucrative and it’s also about an occurrence from before he occupied the position he’s now in. But clearly this episode is a reflection on his character and a record of having taken bribes on the back of public service is the poorest example the country’s number one educator should be giving. Both appointees were direct political choices of the Labour administration. Both of them had been in the civil service before Labour came to power but both have been appointed to senior ranks by Labour on grounds that appear to be predominantly partisan. 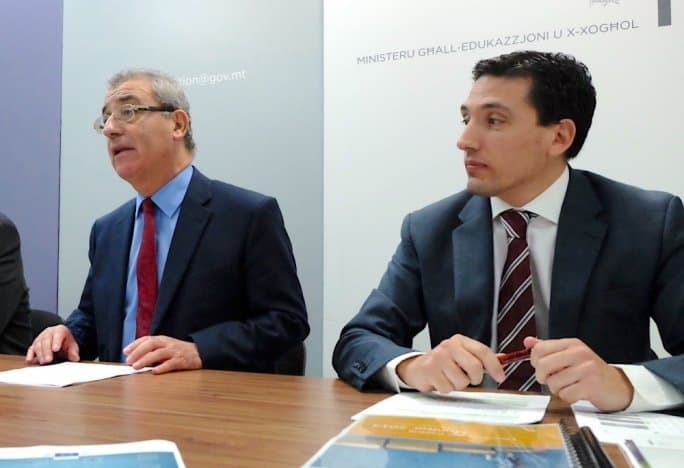 Evarist Bartolo’s Ministry is already tarnished with the revolting scandal of Edward Caruana, he who solicited bribes for school construction and repair projects. Get this. Evarist Bartolo’s permanent secretary at the time was Joe Caruana, Edward Caruana’s brother, now in the news because he replaced the corrupt DG Fisheries Andreina Fenech Farrugia in 2010 and was then replaced by her again in 2013. Joe Caruana has since left the Education Ministry and has been replaced as permanent secretary by Frank Fabri. This new, fresh choice now appears to be tarnished by a bribery scandal from when he was a Labour Mayor. Is anyone out there not on the take?